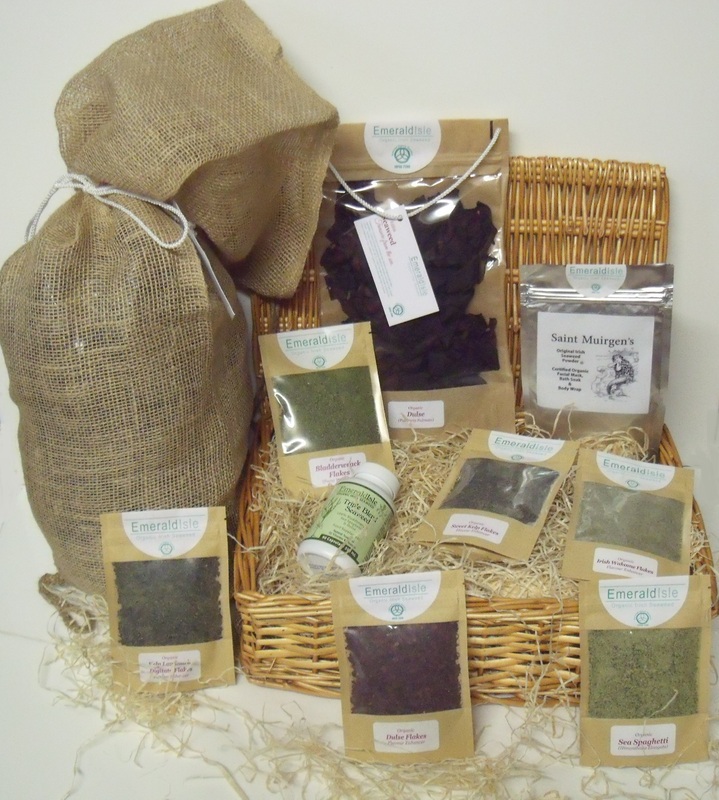 Edible Dulse, Sea Herbs, bath, body, beauty, hamper. 1 x Seaweed bath 200 grams of whole leaf dried kelp seaweed. 1 x St Muirgens seaweed Face & Body Powder 70 grams of Emerald Isle Blend of three seaweeds. 1 x Edible Dulse 50 grams in a resealable sachet. 6 x Sea herbs for health benefits and can be used as a flavour enhancer for cooking, includes: Dulse flakes, Bladderwrack, Sea Spaghetti, Sweet Kelp, Irish Wakame, kelp Digitata 40 grams in each sachet. 1 x Triple Blend Capsules, three seaweeds, Bladder wrack, Sea Spaghetti, and Dulse in capsules. The seaweed bath bag of dried whole leaf seaweed which contains Kelp Luminaria and Fucus Serratus 200 grams enough for 1-2 baths. THE BENEFITS OF A SEAWEED BATH CAN BE GOOD FOR PSORIASIS, ACNE, AID BACK AND MUSCULAR PAIN, ACNE, EASE RHEUMATISM, ARTHRITIS AND IT IS GOOD FOR CIRCULATION. LOCALS HAVE LONG USED SEAWEED TO RELIEVE ACHING BACKS AND LIMBS.SEAWEED BATHS ARE NATURE’S PERFECT BODY/PSYCHE BALANCE. IT IS BENEFICIAL FOR THE SKIN AND HAIR AND LEAVES A FRESH”GLOWING” FEELING. SIMPLY RUN A HOT BATH AND LET THE SEAWEED SOAK INSIDE THE BATH FOR 5/10 MINUTES BEFORE YOU GET IN (MAKING SURE THE WATER S NOT TOO HOT!) AND SOAK AWAY ALL YOUR ACHES AND PAINS. SEAWEED SPAS WERE ONCE FAMOUS FOR ALL SORTS OF BODILY AILMENTS, ALSO PERFECT FOR A RELAXING, MIND SOOTHING, EXPERIENCE. PEOPLE REPORT THAT AFTER A SEAWEED BATH THEY FEEL “LIFTED” AND “LIGHT”. THE SEAWEED IS FANTASTIC FOR SKIN AND HAIR CONDITION. Emerald Isle Seaweed Powder Blend of three seaweeds 70 grams can be used as a facial mask, for your arms, legs and feet, or as a hair treatment. Just add a little filtered or bottled warm water to the powder until it becomes a paste. This is a great way to treat your skin and get rid of spots, black heads, unclog pores and stimulate the circulation. The antioxidant, moisturising and anti-ageing properties in seaweed helps keep the skin healthy. Edible Dulse is a good source of minerals and vitamins compared with other vegetables, contains all trace elements needed by humans, and has a high protein content. Triple Blend Seaweed is a completely natural, organic product and a source of over 70 vitamins and minerals (nothing added) also contains proteins, selenium, antioxidants, essential fatty acids,(including omega 3) phenol’s, enzymes, trace elements, amino acids, and all the rare nutrients like B12 , zinc. Beneficial for the gut bacteria. Triple blend also has a low iodine content to suit certain diets and this brings it within the recommended daily intake for iodine. Total of 45 grams of pure 100% seaweed in 90 capsules. Total iodine content of 140 mcg in each capsule. Serving Size 1 tablet (HPMC capsule) Suitable for vegetarians. Contributes to normal cognitive function, to normal energy-yielding metabolism, normal functioning of the nervous system, the maintenance of normal skin, the production of thyroid hormones and normal thyroid function. Relax and enjoy a calm and peaceful Christmas.